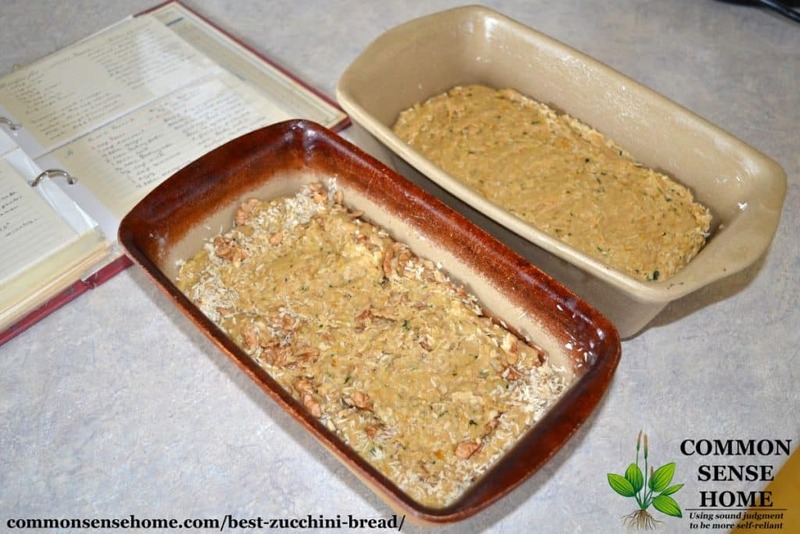 My husband and I like nuts in our zucchini bread and my youngest doesn't care for them. To make everyone happy, I sprinkle nuts on top of the loaves instead of mixing them in so he can dodge them if he likes. I usually mix some coconut right in the batter. 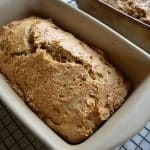 The boys aren't huge coconut fans, but they like it in recipes like this and it makes the bread more filling. 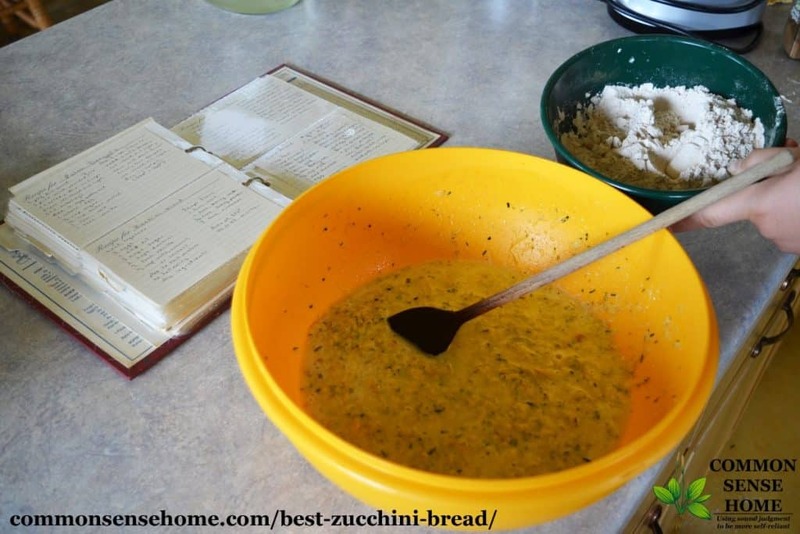 In a medium bowl, combine eggs, butter, sugar, zucchini and vanilla until well mixed. In another bowl, blend flour, salt, baking powder, baking soda and cinnamon. Stir into wet ingredients. Add nuts, coconut or raisins, if desired. Spread into loaf pans. Bake at 350°F for 40-45 minutes, until toothpick stuck in center tests dry. (Gluten free flour will take a little bit longer. Cold zucchini will also increase cooking time.) Remove from pans and place on wire racks to cool. (Click here to getting my favorite cooling rack.) Store in a sealed container for several days, or freeze for longer storage. 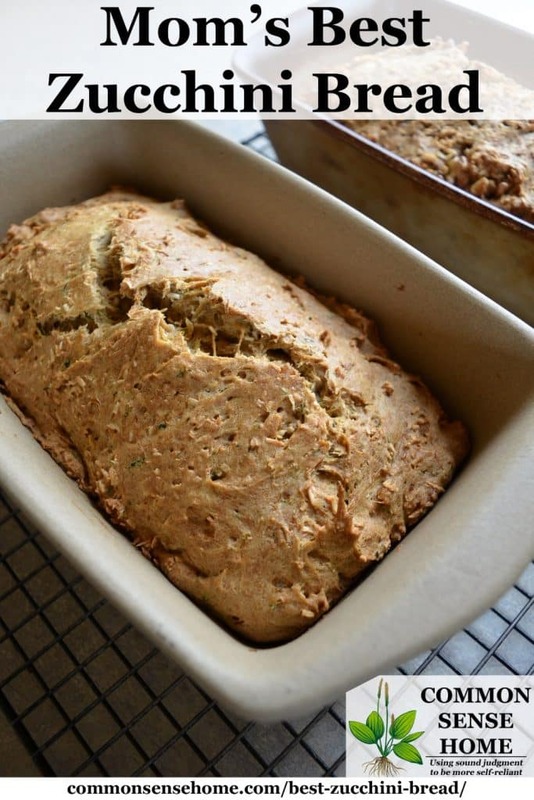 Note: Cracking is normal on the tops of quick bread, including zucchini bread, because of their quick oven rising and lower gluten content than yeast breads. 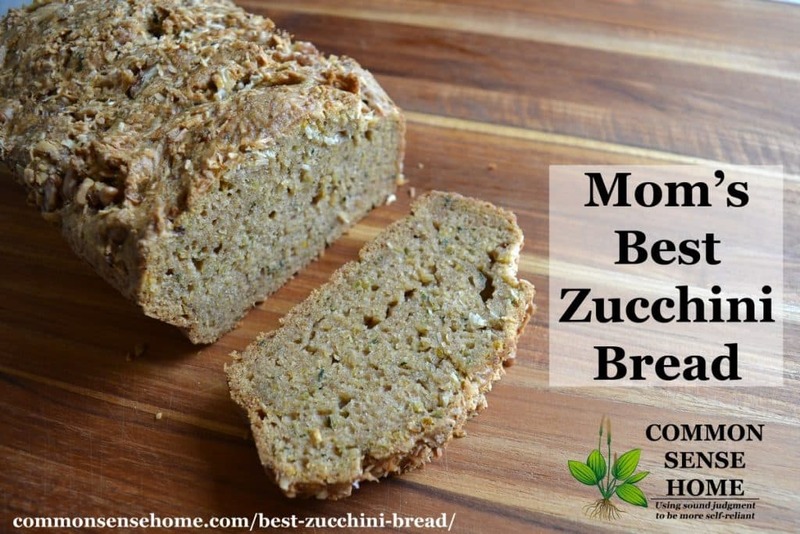 Moist and delicious, this home style zucchini bread pairs great with a warm cup of coffee. Preheat oven to 350F. Grease two 9×5 loaf pans. In a medium bowl, combine eggs, butter, sugar, zucchini and vanilla until well mixed. In another bowl, blend flour, salt, baking powder, baking soda and cinnamon. Stir into wet ingredients. Remove from pans and place on wire racks to cool. Store in a sealed container for several days, or freeze for longer storage. Cracking is normal on the tops of quick bread because of their quick oven rising and lower gluten content than yeast breads. Can not wait to try it . Thanks Laurie. BUT the important part is I like to add coarsely chopped FRESH cranberries. The pop of tartness in the midst of that sweet cinnamony richness is totally delicious. Try it, you’ll like it, I just know it! I was given this recipe in high school (about 45 years ago). It’s a staple here. I freeze shredded zucchini and make it all year. You do need to either use flour on top of the grease in the loaf pan or use the spray that includes flour or it will stick to the pan. Not much sticks in the stoneware pans, but I should probably make a note of that for those who use other types of pans. Made my first batch. Delicious. I did substitute a coconut oil spread for the butter, used only 1 cup of sugar, used glazed walnuts and raisins and used the same spread to grease the pan and a little flour. The breads slipped right out. Glad it worked out well. Thank you for sharing your experience for those avoiding dairy.